As the industry of optical communication develops rapidly, the design of optical fiber transceiver is more and more diversified, so as to meet the needs of Gigabit Ethernet. Therefore, various types of mini GBIC (SFP, Small Form-factor Pluggable) and SFP+ emerged. Gradually, we always see 1000BASE-LX SFP and 1000BASE-LH SFP on many websites. However, many people are puzzled about them. Are they similar or different? If they are different, about 1000BASE SFP LX vs LH: what is the difference between them? SFP LX vs LH: What Are They? If you want to understand 1000BASE-LX SFP and 1000BASE-LH SFP, you first need to understand what Ethernet is. Ethernet was the result of research done at Xerox PARC in the early 1970s, and it later developed into a widely implemented physical and link layer protocol. Fast Ethernet increased from 10 to 100 megabits per second. Gigabit Ethernet was the next iteration, whose speed was increased to 1000 megabits per second. The initial standard for Gigabit Ethernet was produced by the IEEE in June 1998 as IEEE 802.3z, which is often referred to as “1000BASE-X”. 1000 BASE-X is used in industry and refers to Gigabit Ethernet transmission through fiber optics, including 1000BASE-SX, 1000BASE-LX10, 1000BASE-BX10 and our today’s topic 1000BASE-LX. The rate of 1000BASE-LX SFP is as high as 1.25Gbp/s, and the wavelength of long wavelength laser is 1270nm to 1355nm. LX SFP can be used in single mode and multimode systems, which makes them have some advantages in multimode applications. Although LX SFP is designated to transmit up to 5 kilometers of data over a single mode fiber, it also supports multimode fiber systems with a maximum distance of 550 meters. It is noteworthy that for a distance of more than 330 meters in a multimode fiber, a special transmit-modulated patch cord is needed to reduce the differential mode delay effect. LH means longer distance. 1000BASE-LH also refers to Gigabit Ethernet transmission. 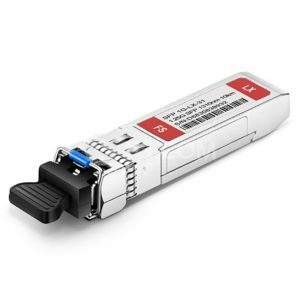 The wavelength of 1000BASE-LH SFP is 1310 microns, and the transmission distance is between 25 km and 70 km. However, 1000BASE-LH is only a term widely used by many suppliers. SFP LX vs LH: What’s the Difference? Both 1000BASE-LX and 1000BASE-LH refer to Gigabit Ethernet transmission. Between them, just like mentioned above, 1000BASE-LX is the standard stipulated of IEEE 802.3. It uses long wavelength lasers. While 1000BASE-LH is only a term widely used by many suppliers. Besides, LH means longer distance, while LX (long wavelength) means shorter energy, which is obviously shorter distance. The 1000BASE-LX SFP module compatible with the IEEE 802.3z 1000BASE-LX standard, it can achieve a distance of 10 km over a single-mode fiber. Unlike the 1000BASE-LX SFP module, 1000BASE-LH SFP module can operate at a distance up to 70km over single mode fiber. Does 1000BASE-LX SFP Work with 1000BASE-LH SFP? 1000BASE-LX SFP and 1000BASE-LH SFP are the most commonly used components in Gigabit Ethernet applications. Here comes a little question: Does 1000BASE-LX SFP work with 1000BASE-LH SFP? The answer is: Yes, 1000 BASE-LX SFP can work with 1000 BASE-LH SFP. For example, Cisco 1000 BASE LX/LH SFP is either made for single mode (long distance) or multimode (short distance). But this module can also be used for both single mode and multimode. In additional, as there are so many types on the market, careful attention should be paid to the distance and price differences between multimode and single mode fibers. To sum up, about the topic “1000BASE SFP LX vs LH”, we can conclude that: 1000BASE-LX and 1000BASE-LH both refer to Gigabit Ethernet transmission; between them, 1000BASE-LX is a standard, 1000BASE-LH is the term widely used by suppliers. FS.COM offers a wide range of 1000BASE-LX/LH SFP transceiver modules which are compatible with major brands, like Cisco, Juniper, Dell, Brocade, etc. Our optical transceivers are able to fulfill enterprises, service providers, telecom operators and SAN providers to build and fulfill their existing and future network expansions. If you have any need, please contact us. This entry was posted in SFP/SFP+ and tagged 1000BASE-LX SFP, cisco 1000base lx lh sfp, sfp lh, SFP LX vs LH on August 21, 2018 by Admin.